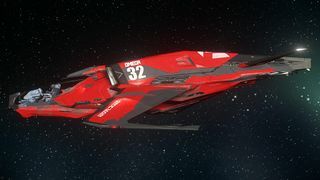 The Consolidated Outland Mustang Omega is the limited edition racing model sponsored by Accelerated Mass Design that also has one more engine and a larger powerplant. 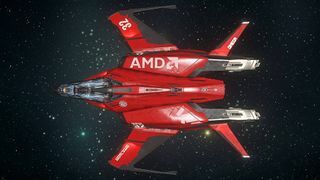 The paint job is designed by resident underground artist Sektor8 on the request of AMD. Mustang Alpha: The base model of Mustang. Mustang Beta: The exploration/touring model of the Mustang. It has a bed and kitchen in the back. 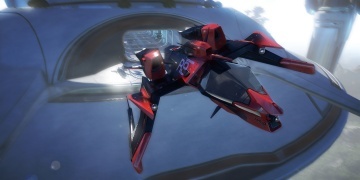 Mustang Gamma: The racing model of the Mustang with a larger powerplant and one more engine. 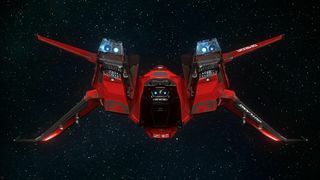 Mustang Delta: The fighter model of the Mustang with increased weaponry. 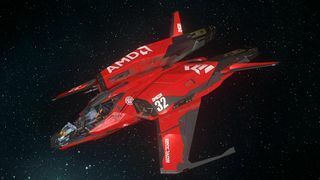 The Mustang Omega is part of the AMD Never Settle Space Edition promotion, where the ship comes with the purchase of an AMD Radeon™ R9 or R7 Series graphics card. 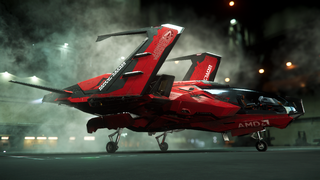 The Mustang series went through a rework from 2017 to 2018, and it was released in Star Citizen Alpha 3.3.0. 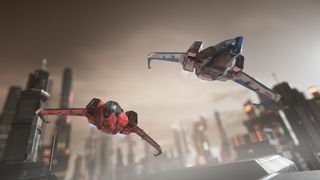 For a full gallery, see :Category:Mustang Omega Images.